La Pasticceria (pronounced pa stee cher EE a) is the Italian pastry shop. You can go early in the morning for a good breakfast pastry (Italians often eat a cornetto for breakfast), in the afternoon for a sweet treat, or to buy pastries to take home. Some pasticcerie (plural of pasticceria) serve coffee and tea as well and may be called a Bar/Pasticceria. If you need to buy someone in Italy a gift to repay a small kindness or you're going to their house for a meal, often bringing a small tray of assorted pasticcini (little pastries) or biscotti (cookies) from a good Pasticceria may be appropriate. Pasticcini, or small pastries, may also be called mignon. You'll see pasticcini in the display case if they have them and you can ask for an assortment, indicating the number of people you expect to be eating them. Some places have pasticcini only on Sundays and holidays or have a bigger assortment on these days, as they are commonly brought when going to someone's house for Sunday lunch. 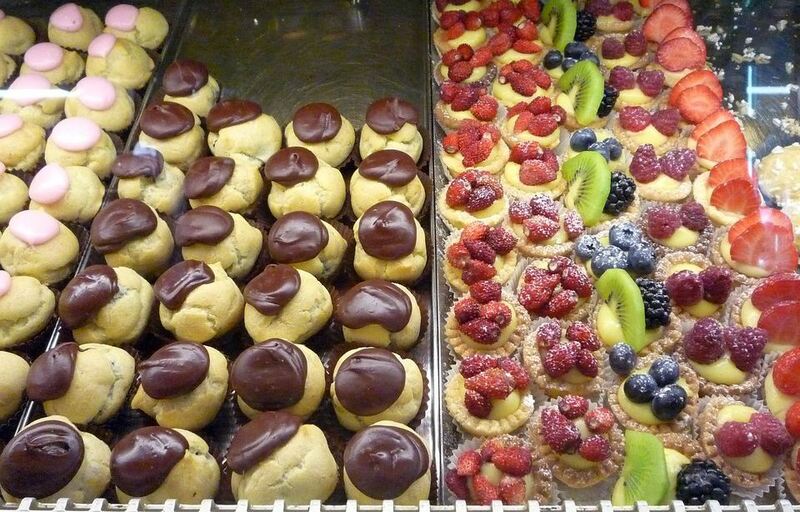 Pasticcini and biscotti are usually sold by the kilogram if they are small. Ask for un etto, or a tenth of a kilogram, to get about a quarter pound of goodies or you can specify how many you want and they'll weigh them to get the price. Sometimes they are sold by the piece if you are just buying them to eat there but are weighed if you buy an assortment to take away. You will sometimes find good Italian ice cream, gelato, in a bar-pasticceria, especially in a smaller town that might not have a gelateria, and sometimes they will even have small sandwiches or foccaccia for those who prefer to eat something savory rather than sweet. It's fun to spend a little time browsing the displays at a pasticceria which can be very creative and tempting! Since the usual Italian breakfast is a cornetto, or other pastry, and coffee or cappuccino, most bars have some pastries in the morning. The most common are cornetti, which may come with chocolate, cream, or marmalade filling or can be empty (vuoto). They are sometimes in a small case above the counter so you can grab a napkin and reach in to choose your pastry. Or you may need to ask (or point to) for the one you want. This type of pastry is called pasta but can also be referred to as a cornetto or brioche. Sometimes bars also carry a small assortment of pasticcini on Sundays, especially when there is no pasticceria in town, and some may carry a wider variety of breakfast pastries. Before you go, be sure to know how to order coffee in Italy. What is an Italian Autostrada? What Are the 20 Regions of Italy? What is a Palio? No, it is not a Horse Race. Should You Buy an Italian Rail Pass to Travel by Train in Italy?